Along with the next-generation 2017 Honda Accord, our spy photographers have also caught the 2017 Honda CR-V being tested in hot weather. This is the second time we’ve seen the upcoming fifth-gen SUV which, when it launches next year, will mark the 20th anniversary of the Comfortable Runabout Vehicle – the first one was introduced all the way back in 1997. Although the mule is still fully covered in camouflage, the lack of any bulky cladding means that we can have a pretty clear look at what’s in store. The front end looks to be an evolution of the current car’s face, with the swept-back headlights tying in with a thick bar above the grille, making up Honda’s “Solid Wing Face” graphic. The downturned centre air intake in the bumper also looks similar to the one before. Honda has added some extra cladding since the last time around, but previous spyshots have shown that the teardrop-shaped glasshouse, upswept beltline and blown haunches of the outgoing model have been kept, although the impression is that the side profile of the new car is now sleeker. It’s the rear of the car that is a departure from previous CR-Vs. Instead of the vertical tail lights equipped on past models, the new car is set to gain sleeker items that are reminiscent of those on the XR-V (Dongfeng-Honda’s version of the smaller HR-V). 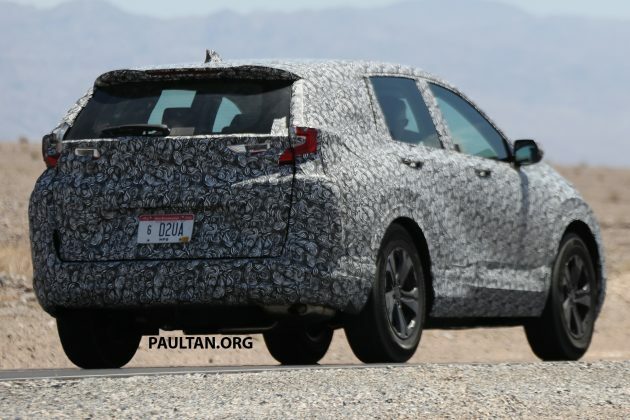 Unlike that car, however, the next CR-V’s tail lights will also extend upwards, much like those on the Jazz. Interestingly, this particular prototype only has one exhaust pipe on the right side of the car, instead of the twin exits found on the previous car. This, along with the regular projector headlights (rather than full-LED units), suggests that this car is a naturally-aspirated model instead of a turbocharged one, perhaps using a carryover 2.0 litre R20A engine. Set to replace the 2.4 litre K24A engine is a downsized turbocharged engine, likely the 1.5 litre VTEC Turbo mll from the new Civic. Also from the Civic is the platform, also shared with the next Accord. It’s also a given that the new model will be larger than before, which is apparent here. 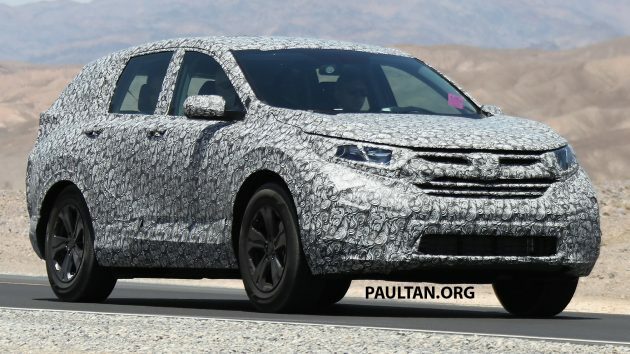 Meanwhile, Honda Australia has recently indicated that the next CR-V may get a seven-seat option to distance it from the HR-V. If that is so, it’s likely to mirror the similarly-sized Nissan X-Trail’s 5+2 seating layout rather than having seven proper seats.